You’re headed into the water as the sun has just slipped below the horizon to enjoy one of the most active times in the ocean. The key to seeing the action below the waves is your trusty dive light. This branch of the dive equipment field has seen some of the most significant developments in the industry over the last several years. As Xenon and Krypton bulbs gave way to HID, so has HID started to move to the side for LED technology. LED lights offer more burn time, cooler operating temperatures, and produce whiter light that penetrates even the turbid waters of the Great Lakes. 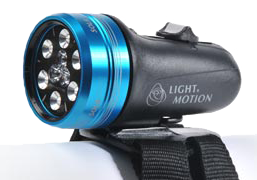 At the tip of the LED spear is the Sola Dive lights by Light and Motion. Since their release in February of this year, these little powerhouses have been one of the most talked about items here at Rec Diving. People love the Solas because of their light weight and compact size, but they sometimes shy away from these beauties when they compare them pricewise to the other LED lights. While they might cost a little more at the register, I’m going to tell you how the Solas will save you more than three times their cost in the long run. Like so many of the advantages of the Sola series, in terms of cost savings it all comes down to the batteries. The Sola lights use a sealed lithium-ion cell that is rated for at least 500 charging cycles. To compare it to the C4 eLED from Underwater Kinetics, we’ll also need to consider the burn time for each light at a similar output level. At it’s max power, the C4 eLED is capable of producing 275 lumens of light for a burn time of 480 minutes. 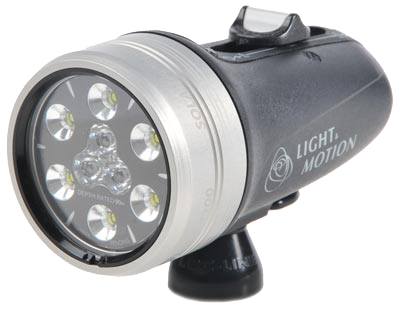 The Sola Dive 1200, on the other hand, is able to produce 300 lumens of light (using it’s lowest output setting) for a total of 280 minutes. It’s the recharging aspect of the Sola that really allows it to start saving you money. If we consider that the Sola is capable of running for 280 minutes and can be charged 500 times, it yields 140,000 minutes of burn time during it’s batteries lifespan. When we consider that it would take 290 sets of 4 C-cell batteries for the C4 eLED at a cost of about $10 per set, the total cost of those 140,000 minutes of burn time comes in at a staggering $2,900.00. This might seem like enough of an advantage, but it keeps getting better. What happens when your Sola won’t take a full charge after it’s 523rd charge? Simply bring it in to Rec Diving and we’ll send it back to Light and Motion to have a fresh battery cell put in and the unit resealed. This refresh will only set you back $75 at which point you’ll be able to enjoy another 500+ charges. Switching to the Sola could also equal 1,160 batteries that don’t end up in the landfill. At Rec Diving, we believe that’s one of the biggest advantages at all. Come in and check out this remarkable light.